Can you believe we are already on day 9 of our Vegan Box ’12 Days Of Christmas’ giveaway, wow it’s been so fun that we wish we could keep going forever! 1 x *New* Pop Top Kit – Perfect size for smoothies, infused water or a beverage on the go. These awesome new lids are totally sealable and even make a great water bottle.! 1 x Green Silicon Regular Lid – Fits any regular sized mason jar turning into into a to-go drinking vessel! 1 x Long Spoon – cause sometimes you need to reach the bottom of your jar!! 1 x Jar Jeans – Made from 100% recycled jeans these are perfect for smoothies in winter or carrying your jar by your side out and about! Plus a few Stainless Steel Straws to take anywhere and everywhere you go!! Ecojarz for us has always been more then “just a jar”, our products are our vessel in which we want to share with you our passion for the environment and encourage others on making small sustainable choices in their daily lives. Born from passion for the environment and individual health these high quality products are sustainably and ethically produced from start to ﬁnish.! Holly, and husband Will have taken on the distribution of Ecojarz in Australia and New Zealand to provide sustainable and healthy alternatives for both you and the environment. 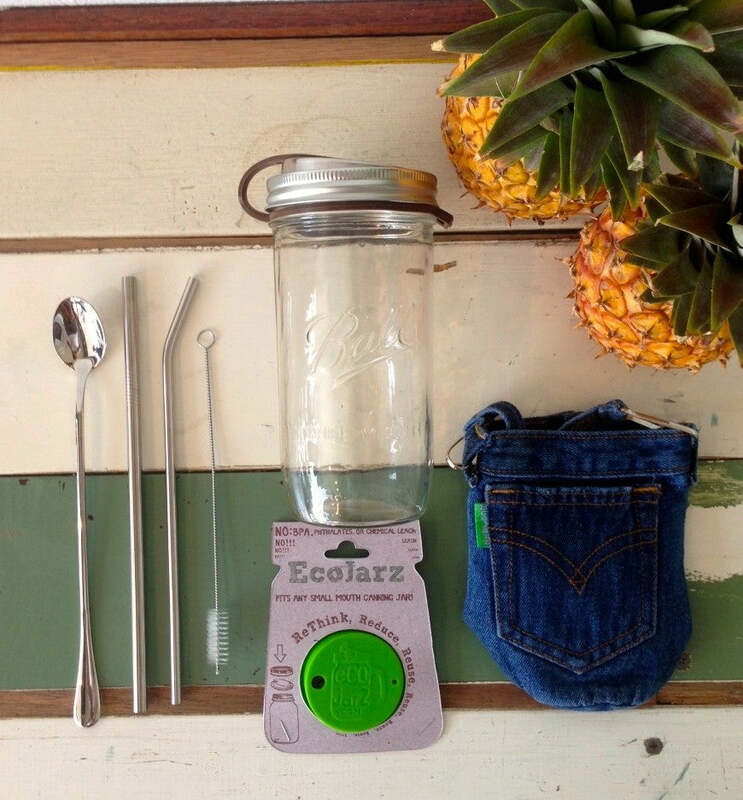 Ecojarz drink lids will ﬁt any standard mason jar – turning it into a glass to-go drink vessel. The tops are made from high quality stainless steel with an FDA gasket to prevent spills and leaks. 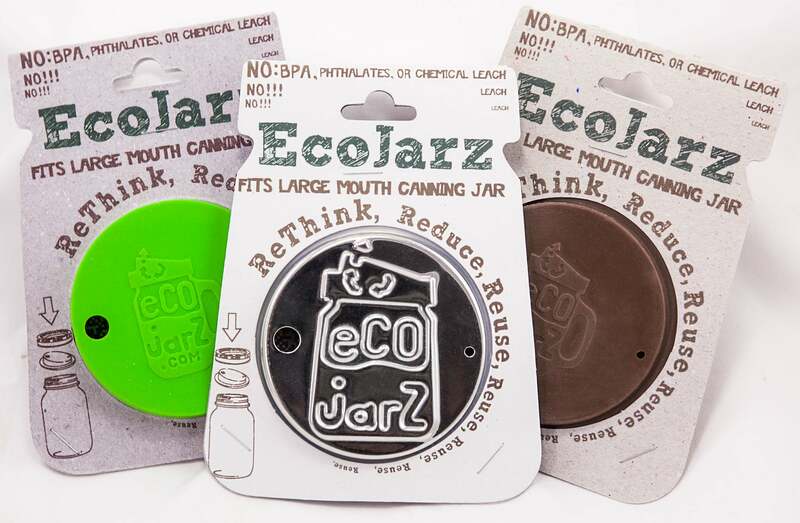 Ecojarz also promotes the opportunity to up-cycle your jars and drink toxic free. Other products include: reusable stainless steel straws, glass straws, stainless steel tea infusers jar cozzies and more.! 1. One entry per person per day allowed. 3. Include your email address or a link to your website where I can comment or find your email address. 4. This competition is open to Australian Residents ONLY. 6. The prize consists of Naked Treaties superfood truffles box valued at $42, Delicious Skin duo valued at $46, Passion Vegan Cookbook valued at $39.95, Coconut Tree skincare valued at $29.90, Decadent Handmade Chocolate pack valued at $45, Bake Mixes Bake Box valued at $29.95, D+T Beard Care Duo valued at $43, IME Perfume pack valued at $74, EcoJarz pack valued at $65, Bare Blossom makeup valued at $79.95, Your Core Light Jewellry valued at $98, and Lifestream Supplements Pack valued at $200. 7. Competition opens 6:00am Monday December 1st and closes 11:59pm Friday 12th December 2014 AEST. 8. This competition is a game of skill and the winner will be based on the most interesting comment as judged by The Vegan Box team, and notified by email and via a post on The Vegan Box blog by Tuesday 16th December 2014. My favourite smoothie is almond milk, peanut butter, strawberry, raspberry, almond butter, avocado, agave, and a pinch of Himalayan salt. Definitely a treat smoothie but oh so good! The I am powerful smoothie from Naked treaties in Byron Bay! Absolutely delicious. Otherwise anything similar to that including: coconut milk, frozen berries and banana and some spinach, pinch of cinnamon. Mmmmmmmmmmm. Or have some dates added as well. I love it when theres chunks of dates you can eat in a smoothie. Or when the smoothie is topped with cereal. Just smoothies in general are absolutely amazing my mouth is watering thinking about it. This is a hard one to answer!! I would probably say the ingredients that make up my all time fav smoothie would be – almond milk, frozen bananas, chia seeds, cacao, avo and a little of something sweet like pear or a couple of dates!! My favorite smoothie is definitely a spinach, pineapple mango, chia seed, almond milk with the occasional dash of mint! So yummy and the perfect morning breakfast to pair anything! My absolute favourite smoothie combo is mango and vanilla bean yogurt….delicious! I love a good banana smoothy, I know it’s a bit boring but it’s what I like!! My absolute favourite smoothis combination is avocado and chocolate! Half a ripe avocado, one teaspoon of cocoa powder, a hanfdul of blueberries, a handful of raw almonds… so easy and a delicious creamy smoothie! I love a classic cocoa banana myself! With coconut yoghurt, cocoa powder, maple syrup, almond milk, cacoa nibs, banana of course and my all time favourite spice-cinnamon! My fav go to is a choco mint dream – frozen bananas, ice, coconut water, fresh mint, cacao and cacao nibs on top. I love mango, almond and coconut milk, chia seeds, flaxseeds and rice malt syrup. Mine is with Avocado, Banana, Blueberries, Cucumber, Kale, Coconut Water & Cacao (it’s my nieces favourite too)! I used to be a chocoholic, so this smoothie keeps those nasty cravings at bay! I have one pretty much every day! I love frozen strawberries, chia seeds, watermelon, kiwifruit, carrot and apple. Coconut milk, pineapple, a squeeze of lime, chai seeds, a dash of honey and lots of ice!!! almond or soy milk, walnuts, vanilla and frozen berries – and blend. My favourite smoothie Combo is BANANA AND COCONUT!! yum yum! I use frozen bananas, coconut milk and water. I love this combo because it tastes delicious; it’s packed full of nutrition; and it’s such a simple recipe whether you are vegan or not. If it’s too sweet or too thick just add some extra water. Strawberry, mango and coconut milk! Its so delicious! I usually transport all my drinks in glass jars, except coffee, which its own special travel mug. Everything tastes better out of glass! I just love my morning Smoothies, I make in my NutriBlast, it always has either Kale or Spinach, heaps of different mixed fruit but always with a banana, Chia seeds, Goji berries, Hemp seeds, a date and sometimes some Alpine coconut cream… This breakfast sets me up for the whole day! Mine always has kale in it! Lemon and orange juice, a grated cucumber, a frozen banana anda sprig of mint with kale. My favourite is mango, passionfruit, banana, spinach, mango nectar, blueberries, strawberries kale, coconut milk and coconut water! Soy milk, vegan protein, Vital Greens, chia seeds and mixed berries (strawberries, raspberries, blueberries). The absolute BEST way to spend an afternoon in the Aussie summer is to sit down and watch the cricket with the family with a MEGA SMOOTHIE GLASS of MANGO, PAPAYA, BANANA, SPINACH, COCONUT MILK, CHIA SEEDS, a few BLUEBERRIES, a little MINT from the back garden, topped with ice cubes, coconut flakes, cherry, maybe some pineapple and maybe some more mint! Long live the Aussie summer! Favourite smoothie is: coconut water, raw vegan vanilla protein powder, cashew nut butter and banana!!! Amazing!!! 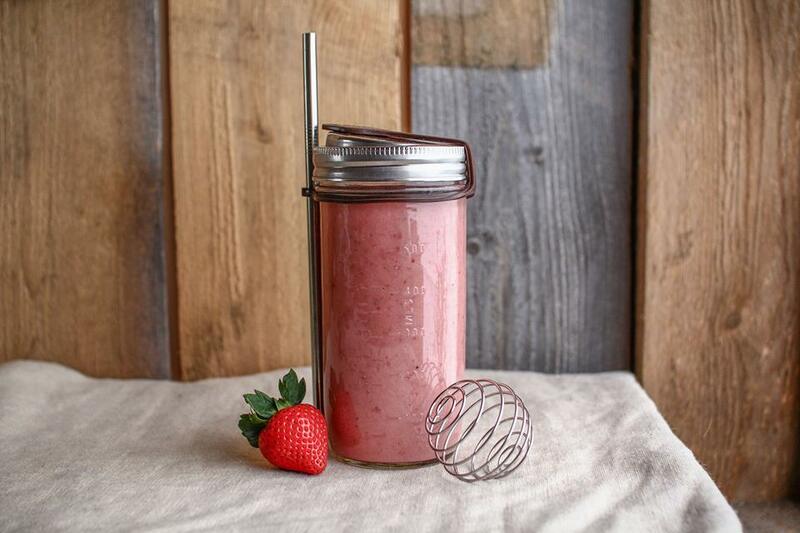 The ecojarz would be a perfect match with my smoothie recipe !! In no particular order: Generous amount of cacao powder, banana, protein powder, date, vanilla, almond mylk, blueberries and a sprinkle of cinnamon and cacao nibs on top!